Biryani is the talk of Indian diners in Virginia lately. A delicious aromatic Indian rice dish, Biryani is popular in both North India and South India. From Arlington to Fairfax, Herndon and Ashburn, Indian restaurants in Virginia serve a rich variety of Biryanis. 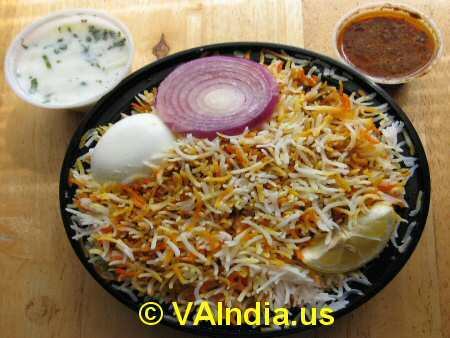 Hyderabad Dum Biryani is the flavor of Biryani lately and has put regular Biryani in the shade. Hyderabad Dum Biryani is offered by restaurants managed by people from the South Indian states of Andhra Pradesh and Telangana. Hyderabad Dum Biryani comes in several varieties - Chicken Dum Biryani, Vegetable Dum Biryani, Egg Dum Biryani and Goat Dum Biryani.